HP today unveiled new consumer PCs and commercial displays that offer consumers and professionals superb design, performance and convenience. • HP Omni27 PC – the company’s first 27-inch all-in-one PC, and the first non-touch HP PC to feature exclusive HP Magic Canvas software for a truly engaging experience. • HP Pavilion HPE h9 Phoenix PC – the most powerful HP Pavilion PC to date, it is engineered to run power-hungry applications, such as video editing and games, with ease. • HP Compaq L2311c Notebook Docking Monitor – built to pair with a notebook PC via its USB port, creating an efficient, comfortable workspace for mobile professionals. • Affordable HP LV1911 and HP LV2011 LED Backlit LCD Monitors – delivering intelligent design and reliable business performance at a great value. The HP Omni27 All-in-One PC is crafted for consumers who demand meticulous design, enhanced performance and an expanded viewing experience. Its elegant flat-panel display features edge-to-edge glass and tilts up to 25 degrees, allowing users to adjust the 27-inch-diagonal high-definition (HD) screen to their comfort level. The HP Omni27 features HP Magic Canvas software, enabling users to expand the desktop horizontally to accommodate photos, videos and applications. Microsoft Windows® desktop shortcuts, task bar and start menu can all be accessed through the HP Magic Canvas, so users can work without ever leaving the interface. HP LinkUp lets users access and edit content from a notebook PC on the HP Omni27 PC’s large display with virtually no file transfer hassles. The HP Omni27 offers multicore processors, advanced HD graphics and up to 2 terabytes (TB) of storage. Additionally, features such as Beats Audio™, HDMI-in and an optional Blu-Ray disc drive or TV tuner make it the ultimate multimedia machine. Users also can connect the optional HP Pulse Subwoofer to complement the rich sound of Beats Audio and add depth of sound to movies and games. Distinct hardware details, including an armor-plated design that extends across the top and front of the bezel, attention-grabbing lighting and a slanted window on the side of the chassis to see its inner technology, make the HPE Phoenix a standout among desktop PCs. It also offers a valet tray equipped with USB ports for easy access and charging of smartphones, digital cameras and MP3 players. Exclusive features such as HP Magic Canvas, HP LinkUp and Beats Audio offer users the latest in convenience and sound. Users also can enjoy playing “RIFT,” the dynamic role-playing game from Trion Worlds Inc., included at no additional cost with the HPE Phoenix. The HPE Phoenix includes four dual in-line memory modules (DIMM) to accommodate up to 16 gigabytes (GB) of DDR3 memory and three internal hard drive bays, while its high-end discrete graphics cards, up to 250W, can support multiple displays and deliver captivating video performance and picture quality. An optional liquid cooling system draws heat away from high-performance processors, helping to protect sensitive components from heat overload and extending the life of the PC. Ideal for notebook users in shared or permanent work spaces, the HP Compaq L2311c sports a full HD, LED backlit LCD display panel(1) and features HP Smart AC Technology(5) that powers and charges HP notebook PCs while also detecting and regulating the capacity of the electrical current. The HP Compaq L2311c efficiently creates an expanded plug-and-play workspace for increased productivity with one USB connection that provides full HD video,(1) internet connectivity and access to peripherals directly from the monitor’s integrated Ethernet, SuperSpeed USB 3.0 and USB 2.0 ports. The monitor also features a built-in 720p HD webcam(1,6) and is equipped with HP MyRoom business edition software and Cyberlink YouCam, a productive webcam tool that eases communication with coworkers and clients in any location. Also new from HP are the HP LV1911 and LV2011 LED Backlit LCD Monitors, which provide business performance at budget-friendly prices. The HP LV1911 and LV2011 respectively measure 18.5 and 20 inches diagonally and offer VGA inputs, 3,000,000:1 dynamic contrast ratios and 5 millisecond response times. The LED backlighting employed in all three new displays reduces the number and overall size of panel components for an attractive, slim form factor, while also minimizing power consumption when compared to previous CCFL panel monitors. 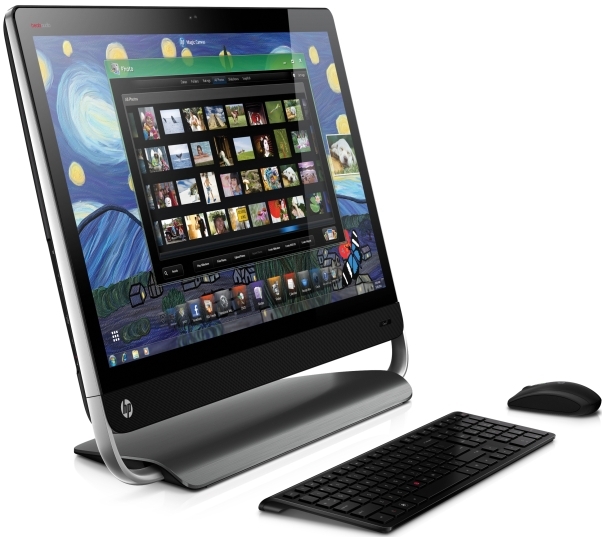 • The HP Omni27 All-in-One PC is expected to be available on Jan. 8 in the United States at a starting price of $1,199.99. • The HP Pavilion HPE Phoenix h9 PC is expected to be available on Jan. 8 in the United States at a starting price of $1,149.99. • The HP Compaq L2311c 23-inch Notebook Docking Monitor is expected to be available in February in the United States at a starting price of $319. • The HP LV1911 and LV2011 LED Backlit LCD Monitors are expected to be available in March and February in the United States at starting prices of $125 and $135, respectively.